This document describes how to build SUMO under MS-Windows using only freely available (this does not mean "open source") tools. Instructions on how to build SUMO on Windows using an Open Source toolchain are included in our building on Linux pages. Please note that you may also download pre-built Windows binaries. 5.1 Linker reports something similar to "LINK : fatal error LNK1104: cannot open file 'C:\Program.obj'"
Download Visual C++ Community Edition. SUMO is only compatible with Visual Studio 2013 or higher. If you are using Windows 8 or later be sure to download Visual Studio for Windows Desktop. Please install all the available Service Packs for Visual Studio as well. Note that with Visual Studio Community 2017 SUMO only can be compiled in Release Mode. We provide a central location for getting all dependent libraries at https://github.com/DLR-TS/SUMOLibraries. The easiest way is to clone this repository and define an environment variable SUMO_LIBRARIES pointing to the resulting directory. They are built with Visual Studio 2017, but may be used with earlier and later versions as well. You may need to install the Visual C++ 2017 Runtime Distributable for running SUMO then (tested with Visual Studio 2013). For details on building your own and also on how to use different versions and additional libraries see Installing/Windows_Libraries. Make sure that the subdirectories fox-1.6.54/lib, proj_gdal-1911/bin and xerces-c-3.2.0/bin are in PATH. Note: for 64 bits compilations folders are fox-1.6.54_64/lib, proj_gdal-1911_64/bin and xerces-c-3.2.0_64/bin. You can add both to the path but always add the 64 bit version first. If you plan to extend SUMO yourself, or just want to know whether everything compiled OK, it is strongly recommended to have a look at Developer/Tests. This tool makes it easier to check whether some existing functionality was broken by the extensions. Note on installation paths: MSVC seems to have difficulties with include and library paths containing spaces (for instance C:\Program Files). Thus try to avoid installing SUMO or any of the libraries in such paths. Linker reports something similar to "LINK : fatal error LNK1104: cannot open file 'C:\Program.obj'"
You probably have installed a library to a path containing white spaces in its name. In such a case, the according environment variable should be embedded in quotes ("). If Visual Studio reports a failed pre-build event you can safely ignore this, unless you are building from the source code repository. In this case you should probably install Python. Even if python is installed the file associations may be broken which causes the generation of src/version.h via tools/build/version.py to fail. Either repair your file associations or undefine HAVE_VERSION_H in src/windows_config.h. 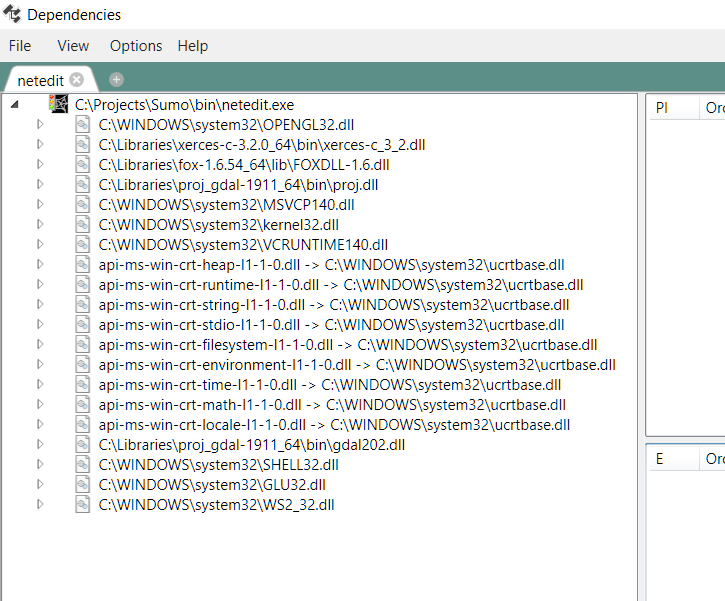 Your version of Visual Studio doesn't support Debugging, only can be compiled in release mode. The release build is used for the distribution of sumo. The Debug build allows all debugging features. Keep in mind that Texttest usually picks up the release build. To switch to a different platform (e.g. 32bit instead of 64 bit) please run cmake again with a different generator. Naming Conventions: 64bit executables have the same name as their 32bit counterpart. The Debug build additionally carries the suffix 'D'.